I still have a ton of cruise pictures that I need to post! This is day three from the cruise. This was our first stop at a port. We were in Grand Turk during the day. It's a small island, we spent most of our time on the beach and lounging on the sand with a nice breeze under the palm trees. The weather perfect and the water was very clear, it was beautiful! This day was a tropical print day. I wore a tropical dress for the day with neon sandals. For the evening I wore wide legged pants with a plain white tee. I have had these pants sitting in my closet for some time but I couldn't find any tropical event to wear them to, so I was finally happy to wear them on the cruise. 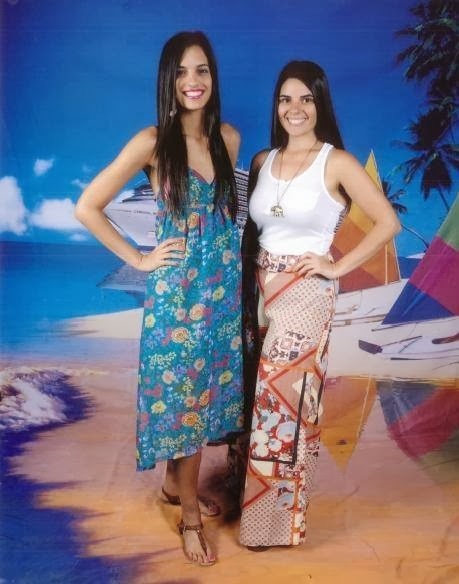 On a cruise everywhere you turn there is always a photographer waiting to take pictures of you, so me and my best friend went ahead posed for the cameras. From my pictures below you can differently notice that we took advantage! I wont overwhelm you with pictures, so here are a few. Hope you guys enjoy!